The National Employment Labor Project (NELP) recently announced new resources designed to support its goal of reducing unfair barriers to employment. The NELP cites workers who are unjustly excluded from work based on arrest records, old and non-serious convictions, and offenses that are not job related. Having written extensively on topics surrounding the use of criminal records in the employment screening process, we see this as yet another opportunity to remind employers of the importance of having a sound employment screening policy in place. The NELP estimates 1 in 3 U.S. adults has a criminal record that would show up on a routine employment background check. Imagine what would happen if every one of those individuals was flat-out denied employment on the basis of having a record, regardless of the details. For an employer to institute such a bright line policy, that employer would very likely be in violation of EEOC guidelines, Title VI of the Civil Rights Act, and may well violate portions of the FCRA and some of its state analogues. Take the time to build fair employment practices or face significant risks. The work of the NELP would not be nearly as critical if employers would take the time to draw out employment screening policies that following existing rules and regulations. The fact is it is rarely, if not never, okay for employers to use bright line policies when it comes to criminal records screening. Instead, employers must establish consistent and equitable processes to ensure any background check is performed and evaluated accurately, fairly, and legally. 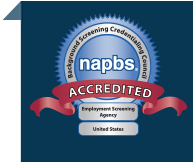 Our employment screening experts can help you design and implement fair employee screening programs that offer you the insight you need to make wise decisions while protecting your applicant and employee base.